The reality for many grandchildren is that visits to grandpa or grandma occur within a nursing or residential facility. When family members need special care and reside in a nursing home, it can be a struggle to engage children during a visit. Before you go, prepare your child for the visit. Nursing or residential facilities can be unsettling for children. Before visiting, speak with your child about what they might see. For instance, they may see people in wheelchairs or walking with walkers. Model appropriate, positive interactions for your child by smiling, waving or even providing a kind hand to the elderly and being at ease within this new environment. Visiting grandpa and grandma should be a positive experience for everyone. Help them enjoy spending time at the facility with these family-friendly activities. Art Explorations. You might have to bring your own supplies, but art projects such as simple paper plate wreaths can celebrate anytime of year. Have a creative art exploration where everyone contributes to the process — coloring, pasting, adding simple ribbon, etc. Other accessible art mediums include watercolors (especially wonderful if there is an outdoor sitting area on a warm spring or summer day), oil pastels (a little more vibrant and easier to produce color than crayons) or even a collage (simply using bits of paper or tissue paper, even to fill in a basic shape such as a heart, sun or clover). Focus on the process of using the materials vs. the final product created. Share A Story. Prompt conversations exploring memorable family times and a grandparent’s younger days. These stories are a great way to engage the mind of the grandparent and carry these tales from generation to generation. Be sure to involve children by giving them an opportunity as a storyteller, as well. If they are stumped for an idea, involve everyone in making up a new story. Start with a phrase such as, “Once upon a time.” Give everyone a chance to make up a line and see where the story goes. Music. With technology, it is easy to bring in music. Many people enjoy listening and singing, tapping or even clapping along with music. Use a site like Pandora to easily stream music from a grandparent’s generation. You may find a child enjoys the tunes, as well, and adds some movement to this activity. Enjoy an impromptu dance party. Even someone with limited mobility can work to move their head, hands or feet. As for singing, tap into children’s songs; familiar tunes like “If You’re Happy and You Know It” can engage everyone in some music making fun. Play A Game. A deck of cards can provide an opportunity for an easy family game. Choose familiar favorites such as Go Fish, War, or Rummy. 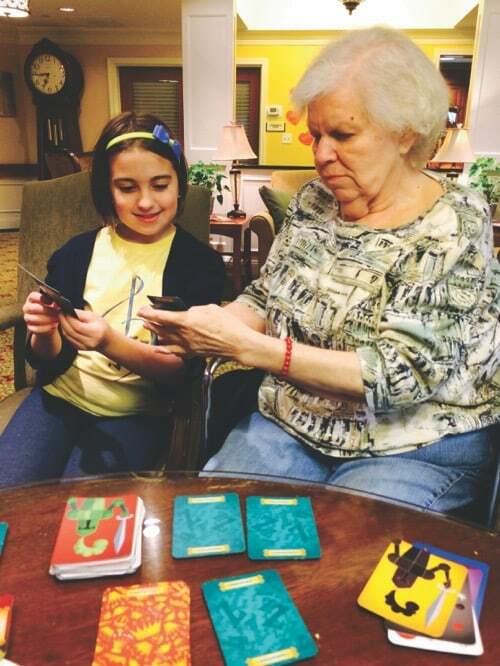 If a grandparent struggles with playing (due to memory issues or the use of their hands), they may simply enjoy watching and interacting as a game is played. Engage in The Activities Offered. Take advantage of the activities offered at the facility. Many have activity rooms, events, or even a published calendar of activities offered for residents — many of which provide great opportunities for family involvement. Examples might include a holiday celebration (i.e. an Easter egg hunt), an afternoon game session, or even live music. With a little planning and thought, children and their grandparents can have a fun and rewarding experience.